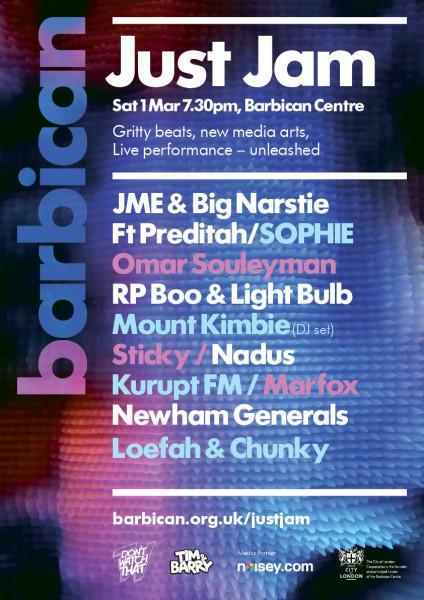 This weekend's Just Jam event at the Barbican, planned to take place on March 1st and featuring several major names from the UK grime scene, was cancelled today, due to the Metropolitan Police expressing concerns about "public safety". The event, organised by photographers and Just Jam founders Tim & Barry, was set to host performances from a diverse line-up including grime artists JME, Big Narstie & Preditah, and Newham Generals. The full line-up also included Omar Souleyman, Chicago footwork artist RP Boo, Loefah & Chunky, SOPHIE, Mount Kimbie and more. The event had been in planning for eight months. In a statement on the Just Jam website, Tim & Barry expressed their disappointment. "We wanted to put on an evening celebrating a diverse range of electronic music and art and are very disappointed that concerns raised by the City of London police mean that the event has been called off. We’re struggling to understand why this has happened and will try to start a dialogue with the police so we can discuss whatever issues they have with Just Jam at the Barbican." Both the Barbican and the Metropolitan Police have been vague about the exact reasons underlying Just Jam's cancellation, with a statement from the City of London Police saying that "a number of factors" were involved in their decision to advise the Barbican that the event could cause potential public safety issues. These included, apparently, the fact that alcohol would be on sale at an event which anyone aged 16 or over could attend, and, rather cryptically "adequate measures in place to address potential issues that might arise, including overcrowding if more people decided to attend than the venue could cater for." Quite why the same factors aren't considered problematic for other events taking place at the Barbican, at which over-16s are free to attend, has not been stated. However, it's worth considering the cancellation in light of the Metropolitan Police's previous cancellations of grime and hip hop events and other nights featuring predominantly black performers and audiences - especially the controversy over Form 696. A risk assessment form that requires promoters to state in advance the musical nature and target audience of planned events, before the original version of Form 696 was revised in 2008, it also asked for details of ethnic groups likely to attend, leading to concerns that it could be used for ethnic profiling of club and gig audiences. While concerns about potential "public safety" issues presented by the Just Jam event were initially brought to the Barbican by the police, in the statement on their website, the City Of London Police stated that despite that, "ultimately, after consultation the decision to cancel the event was taken by the Barbican as the venue.​​​​"